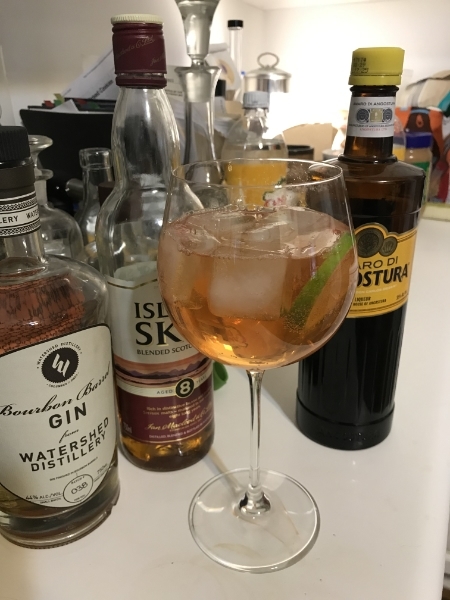 During our travels through Italy last fall, I was delighted to discover the European GinTonic: a gin and tonic with some differences, some tasty, tasty differences. First, it’s not served in a highball glass — it’s served in a big red wine glass. It’s got tons of ice, and rather more tonic than we use here in the States. The big difference though is the palette that is offered by such a setup. Just as here, you have the full range of gins to start with — London dry, Old Tom, Plymouth, modern botanicals —and if you’re picky, the type of tonic water. Then you can add stuff: garnishes, other spirits, etc., and the sky is the limit. The result is a universe of flavors and sensations, and that is the universe I have begun exploring in a new series of cocktails. I’m calling them MDL GinTonics because my initials are MDL; it’s all about the branding, you see. I vacillate between ‘#’ and “No.” in the naming system, so historians, here’s your fair warning: there may be contradictory evidence in your research. At the moment, I’m going with 1.5 oz of gin, .5 oz of some other spirit, and .25 oz of something else to add another layer. Stay tuned. Stir the first three ingredients with ice, then strain into a balloon-shaped wine glass filled with ice. Add tonic water and lime wheel. This GinTonic is very tasty, with the oak/woodiness of the gin forward, followed by the spiciness of the Amaro, and finally a return to the earthy/woodsy tones of the Scotch. It is now one of my favorite drinks. Variation notes: I tried using Laphroaig instead of Isle of Skye, but the strength of that single malt was too much. I also tried bumping the Scotch up to .5 oz, but the drink is better, more subtle, at .25 oz. Shopping notes: the Amaro Angostura is becoming more common in liquor stores catering to the cocktail crowd, but barrel-aged gin can be hard to find, and Isle of Skye is uncommon. Buy them when you see them! I think I’d try ANYTHING you concocted!